24 second basketball shot clocks official game play. Monitor game time shots with these shot clock timers that will accurately enable you to properly time ball possession. 503005 Shot Clock Bracket for 6" (51mm) OD mast pipes. 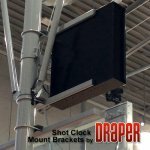 503006 Shot Clock Bracket for 6-5/8" (203mm) OD backstops.